Note to self: next time you’re in a mid-life crisis, do not pick up a Diane Keaton autobiography. I repeat. Do. Not. This time it’s too late. No one warned me. And now I’m fully depressed. Yes, I finished it. And no, it wasn’t bad. Not in the typical sense of the word. Rather, it was just, well, miserable. I slogged through the whole thing thinking, simultaneously, “she can actually write,” and “please let it end.” I feel sorry for Keaton. She sounds regretful about just about everything. In ways I somewhat understand, which only makes it worse. Now I feel sorry for myself. Of course I won’t jump off a bridge. Mostly thanks to Mike. He was able to pull me quickly out of my post “Then Again” ennui, and all it took was one line. Right after I’d finished it, I walked into the kitchen looking sadder than Eeyore on quaaludes. “I just feel so bad for her!” I moaned. And with that thoughts of the bridge quickly receded. 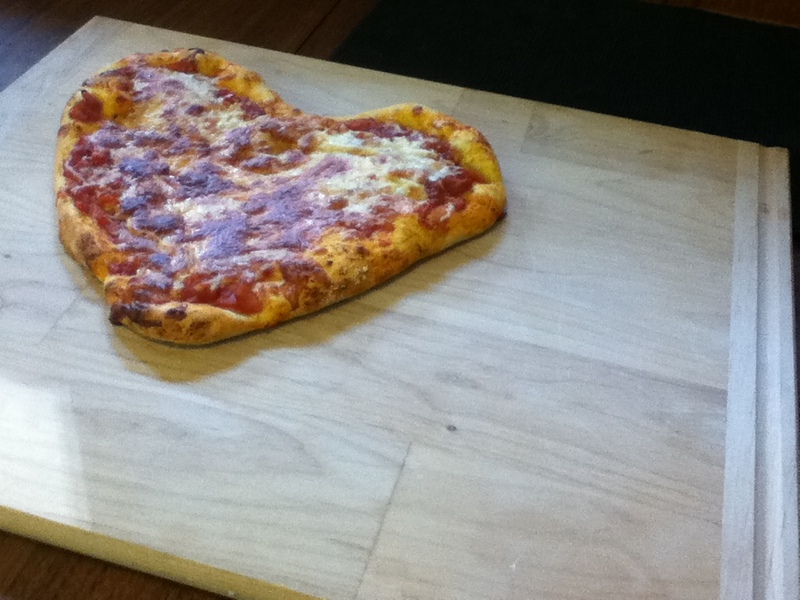 Incidentally, the pizza Mike made was heart shaped. It ended in crumbs, of course, but while it lasted? This entry was posted in Books, cooking, Slice of Life's and tagged bad book club choices, book club for moms, diane keaton bio, diane keaton then again, eeyore on quaaludes, heart shaped pizza, making pizza with kids on July 15, 2013 by thumbstumbler. “sadder than Eeyore on quaaludes.” — Brilliant! I doubt Diane Keaton could turn such a colorful and funny phrase as that! Also, Mike and MJ have once again managed to be in the right place at the right time. Who gives a damn about Diane Keaton? You’re a lucky woman! And MUCH younger! (sorry, Diane). What a sweet husband you have!! !